Scouting in North East England is about Scouting in the official region of North East England. It is largely represented by the Scout Association of the United Kingdom and some Groups of traditional Scouting including the Baden-Powell Scouts' Association. The Scout Association North East Region includes two official regions of Englands, North East England and Yorkshire and the Humber. The Scout Association North East Region contains eight Scout Counties. 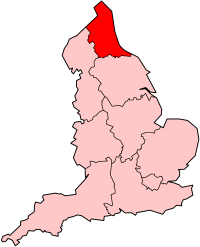 Cleveland, Durham and Northumberland are in the official region of North East England, while Humberside, Central Yorkshire, North Yorkshire, South Yorkshire and West Yorkshire are in the official region of Yorkshire and Humberside and are covered in Scouting in Yorkshire and the Humber. Durham University Scout and Guide Group, and Tyne Universities Guides and Scouts (the Newcastle University and Northumbria University), affiliated with the Student Scout and Guide Organisation (SSAGO), is in this region. A notable Scout at Durham University was Professor John Alan Chalmers (1904 - 1967) who was Durham University Rover Scout Leader, Assistant County Commissioner and District Commissioner for Durham City, with his Scouting and scientific work recognised in his obituary by the Royal Meteorological Society. The first official Scout Camp after the creation of the Scout Movement was at Humshaugh. In 2008, Jamboree 2008 an independent Jamboree, was held near the original site to celebrate the 100 year anniversary of the first official Scout Camp. A notable early Scout in Northumberland was Captain Cecil Victor 'Swannie' Swan, M.C. (1887-1964), a friend of Baden-Powell and a contingent leader to early Jamborees. The Scout Association in North East England is administered through three Scout Counties, Cleveland Scout County, Durham Scout County and Northumberland Scout County. Cleveland Scout County is concurrent with the area of Cleveland, England on the border between County Durham and North Yorkshire, and provides Scouting opportunities for young people and adults in the areas around Hartlepool, Stockton-on-Tees, and Middlesbrough. The County is currently divided into 5 Scout Districts. Durham Scout County covers the political county of Durham and the southern half of Tyne and Wear. Northumberland Scout County covers the political counties of Northumberland and part of Tyne and Wear. the County has introduced an award for Groups, to give them goals and create a more efficient and better group. The award "The County Standard" is gained by achieving a number of goals/targets published every year by County. 2nd Seaton Delaval Scout Group was the first to achieve this award. Northumberland Scout County organises Caud Marra, an annual winter camp at Hawkhirst Scout Activity Centre in Kielder Forest for the Scout section, and fun days for Beavers. The Cleveland Scout Association County Camp Site is Ravengill Campsite]. Stockton District Campsite is "Pybus". 'Seeonee Lair' (Kettleness) Activity Centre is the responsibility of the East Cleveland Scout District. Moor House Adventure Centre is run by Durham Scout Associaion County. It is licensed by the Adventure Activities Licensing Scheme. A number of camping and indoor accommodation is available within Northumbersland. These include the Ford Scout Campsite and Powburn Adventure Centre]. Middlesbrough Gang Show runs every two years. Newcastle Gang Show is the third oldest Gang Show, having been started in 1937. It closed in 1992, but resumed in 1998. There are other Gang Shows in Tynemouth, Whitley Bay and Blyth Valley. ↑ Hutchinson, W. C. A.; T. W. Wormell (1968). "Obituary Notice, Dr. J. A. Chalmers". Quarterly Journal of the Royal Meteorological Society (John Wiley) 94 (399): 121. doi:10.1002/qj.49709439922. ↑ "Humshaugh: - A Fortnight in Baden-Powell's Holiday Camp". "Johnny" Walker's Scouting Milestones. http://www.scouting.milestones.btinternet.co.uk/humshaughcopy.htm. Retrieved 2007-01-26. ↑ Walker, Colin (2008). The Dawn of the World Scout Movement. Write Books. http://www.scouting.milestones.btinternet.co.uk/shop.htm. ↑ Stockton District Campsite "Pybus"
This page was last edited on 6 May 2012, at 15:35.